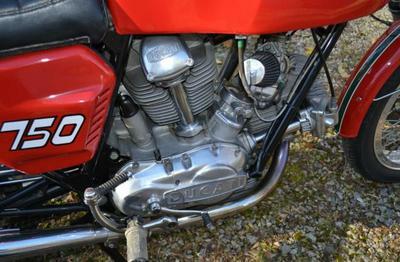 The 1975 Ducati 750 GT for Sale is actually a 3rd production series version 1974 Ducati 750 GT that is titled as a 1975. The motorcycle has just 23,197 miles on it, a very professional burgundy and black "stock style" paint job. The paint looks better than the factory paint ever did and it won't fade and craze like the original paint that Ducati used. All the top end work was done by Hanson Racing Technology in Chico California. Craig stated that the bottom end felt perfect. The 750 GT is classic choice for a rider that will appreciate its smooth torque-y V-Twin motor and superior handling. These are highly sought after collector's bikes that will continue to go up in value while you enjoy its many desirable features. Selling this bike brings me NO joy. New liners (the standard bore pistons were fine). Rockers properly centered on valves (slightly off-center). Custom off-set keys for the cams for each cylinder. Cracked intake stubs have been welded. The rear is now rotated slightly so the adjustment screw is not behind a frame member, which is the correct stock location. New slides, completely gone through by David Harris at Zen motorcycles. All jetting is correct. The accelerator pumps are off-line. The motorcycles run better without them unless you are ham-fisted with the throttle. It runs really well! New Works Performance springs in the front forks with Race Tech Gold Valve emulators. These modifications completely transform the forks giving them a modern feel. Recovered motorcycle seat (Phil from Road and Race in Australia's cover). New rebuilt dash from Bevel Rubber. Everything is new including the dash lights. Note: it has the correct 5 light dash including a neutral light; however no round case motor has a neutral switch! Borrani alloy rims, steel Raedelli rims were stock. New engine sprocket, rear wheel sprocket and Regina chain. Koni 13" #7610-1418 rear shocks. 13" shocks are considered to improve handling and the re-buildable Konis are better than the stock Marzocchis. New gasket lining for side covers, new side cover grommets. and a new two wire voltage regulator. New Sachse ignition with new Dyna coils. Goodbye Volker Sachse! Cibie H4 Concave Lens head light. There are no turn signals, and the wiring for the left switches is not run through the new handlebars. The left side CEV switch is present. The right side has a replacement dual cable throttle and no right side switches for the turn signals. The turn signal wiring is present in the head light shell along with the relays. Uprated blade type fuse block. New LOUD Voxbell high tone horn. The 2nd series originally had two horns, the third series had just one. David Harris at Zen House integrated the new alternator and ignition system neatly into the wiring harness. Good Conti mufflers with no rash; just a couple of very small dents. Exhaust headers just re-plated by Walker's Custom Chrome in Shasta Lake. The Ferrari restoration guys around here all use Walker. Contis are not considered stock on this model and are quite desirable but they are anything BUT quiet. The 750GT has a clear California title and is currently non-operative but that status may change soon. You can probably find a less expensive GT but it won't be as nice as this one. The above-listed upgrades to the suspension and electrical system are significant improvements, not to mention the gorgeous paint job on the motorcycle is a big PLUS. A great deal of detailed and meticulous assembly went in to the top end. This is a very good vintage motorcycle. If you have any questions regarding the 750 GT or if you would like to make an appointment to see it in person or make payment you can do so using the space below that has been provided by GoGoCycles Used Motorcycles for Sale and PLEASE do not neglect to include your contact information in your email or to provide a phone number or email address so that I can respond with answers to your questions or set up an appointment as quickly as possible. 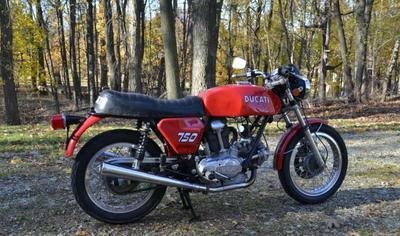 In my opinion there is not a better deal on a GT 750 as this one in Philadelphia Pennsylvania PA, on Craigslist or in an Ebay auction so hurry and make an offer before this sporty little bike gets away from you! My asking price is very good considering all of its outstanding upgrades, condition and features. 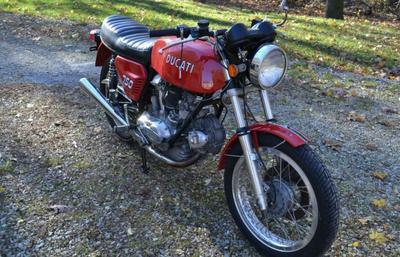 I will accept $24000 in cash (no paypal, no trades, no scams) for the 1975 Ducati 750 GT for Sale sell your bike, buy mine. Join in and write your own page! It's easy to do. How? 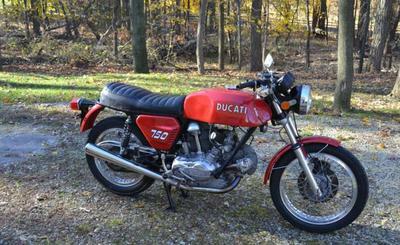 Simply click here to return to DUCATI CLASSIFIED AD.